L. Ron Hubbard called Frank Frazetta the “King of Illustrators” when he commissioned the legendary artist to paint the cover illustration that now graces the upcoming edition of Battlefield Earth. Originally titled “Man, the Endangered Species” the cover depicts Terl, the evil security chief of the vicious alien race, Psychlos, along with Jonnie Goodboy Tyler and Chrissie, the hero and heroine of the story. Battlefield Earth New Edition Announced! A commemorative edition with never-before-published author handwritten notes releases this coming Father’s Day concurrent with an unabridged state-of-the-art full-cast audiobook with over 65 actors, 47 1/2 hours in length, 198 different characters with a soundscape of 150,000 sound effects and over 3 hours of original music. 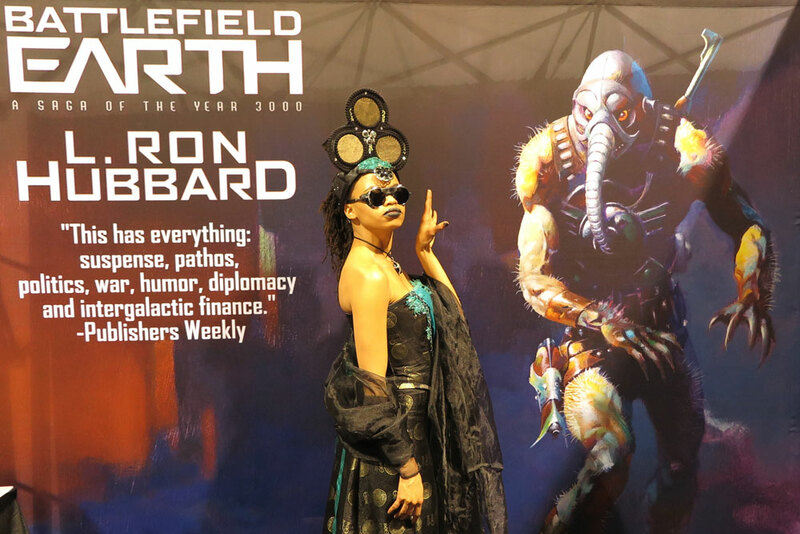 It was no wonder then that we drew crowds of interested public to get their photo taken with our 8′ tall Terl from the new edition of Battlefield Earth—including Chewbacca from Star Wars! Many of those interested public were cosplayers. “Cosplay” is a contraction of the words “costume play” where participants wear costumes and fashion accessories to represent different characters, be they comic books, cartoons, video games, films and TV series. Cosplay began as a hobby in 1990 and has grown to a major force of popular culture. Today, good cosplayers are viewed as fiction characters in the flesh and cosplay has influenced the advertising industry, where they are often used for event work rather than hired models. While cosplay has resulted in very elaborate contests on an international scale, they are also frequently seen at public events, such as the Long Beach Comic Expo where they are a draw for photographers with a simple purpose of modeling their character for still photography rather than engaging in role play for contests. And it isn’t only the pros that enjoy dressing up as their favorite character. The pop culture movement has grown such that fans of all ages—including children—will don their favorite costumes. Young and old alike made sure to get their photo in our booth. 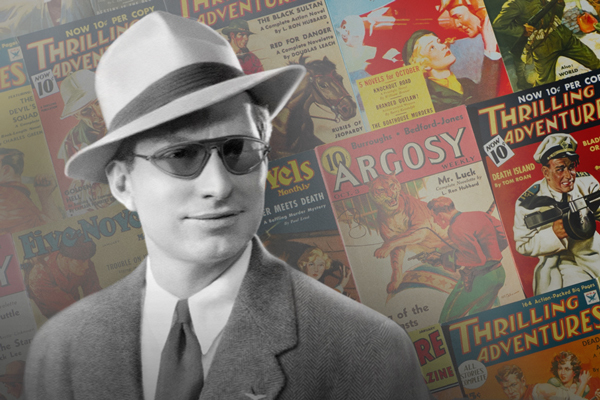 In addition to the pre-promotion for the upcoming Father’s Day release of the Battlefield Earth book and new unabridged audiobook, public also took advantage of the full display of L. Ron Hubbard fiction titles at the Long Beach Comic Expo.